Description: Diablo Blue Methanol Gel Chafing Fuel, is the number one rival of the industry leading brand. 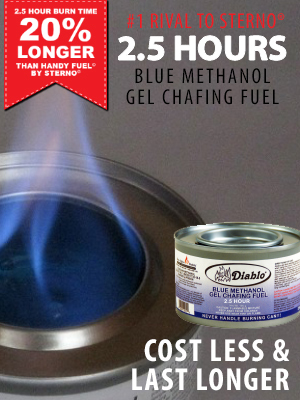 Diablo Blue Methanol Gel Chafing Fuel has a 2.5 hour burn time and is an affordable, convenient, food warming item that is designed to keep chafing food pans consistently at their controlled temperature level. What Is Diablo Dine-A-Heat Gel Chafing Fuel?